With all due respect to the late Dan Hembree, as a researcher and the compiler of this material, some aspects of the story is inaccurate concerning Camp Benjamin. For one thing he refers to one company as being raised in Tarrant County, Texas, when in fact, this is the town of Tarrant in Hopkins County, Texas. In the Confederate Service Records their is no mention of anyone dying at Camp Benjamin specifically. There are deaths recorded on dates in which the regiment is purported to have been encamped there. The Camp is mentioned only ten times in the service records of over 1000 men and never mentioned in association with a death. In contrast however, there is one instance were a death is recorded at Camp Rusk, one month after the regiment was to have moved to Camp Benjamin. It appears that Mr. Hembree assumed these deaths occurred at Camp Benjamin because of the dates. There are several records of men who are recorded to have died before January 1, 1862 in "Paris." They were sent there, apparently for treatment. The same can be assumed of the men whose deaths are attributed to have occurred in Camp Benjamin. Future researchers must be aware that at this time no historical fact exists that proves these allegations except the date of death. No doubt, Mr. Hembree found graves, but researchers must also bear in mind, that this camp is near enough to the homes of the majority of the enlistees and that it would have been very easy to have transported the dead back to their homes for burial as was the custom of the time. Considering the character of Sam Bell Maxey, Colonel of the regiment, I believe it would be safe to assume that at the time he would have been gracious enough to at least try to send bodies to the homes of men in Lamar and Fannin counties. Nevertheless, it is must only be conjecture as to the final resting place of those who died in the fall of 1861 in association with the 9th Texas Infantry. The newspaper accounts herewith are worthy of reprint, however, researchers are warned that secondary sources should be sought to prove any historical facts assumed by these accounts. The following is from a newspaper clipping reused with permission of the publisher from the Honey Grove Signal-Citizen, dated 2 May 1980. Samuel B. Maxey of Paris, Texas, was appointed a Colonel in the Confederate Army by the Confederate Secretary of War, and empowered to raise a regiment of infantry. This Regiment of Ten Companies was organized at Camp Rusk, Lamar County and on the 26th of November 1861. Maxey swore the men into the Provisional Army of the Confederate States. 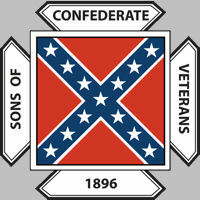 A Confederate Infantry Company was composed of 115 men of these 100 were privates. This was full strength, very few companies of that army were ever at full strength. In December, 1861 Col. Maxey wrote, "The command has been much afflicted with Measles and Pneumonia, since December 1, 1861, but is now improving in health rapidly. The command left Camp Rusk, Lamar County December 11, 1861, on account of the impurity of the water, and other local causes, arriving at Camp Benjamin, Fannin County, on December 13, 1861, the distance being twenty six miles." The health of the regiment must have deteriorated very badly, for Charles deMorse of the Clarksville Northern Standard [news]paper, wrote that the regiment had gone into camp on Onstot's Lake Fannin County, with some 50 or 60 sick. A number are shown on the muster roll as dead but no date or place of death is given. The following are shown as to have died within the time the regiment in camp on Onstot Lake, there may have been others who died there that are not stated on the roll's with a specific date. A cross with suitable inscription was erected last Thursday at a Fannin County Confederate military burial site. At least seven members of the 9th Regiment, Texas Volunteer Infantry, Confederate Army, were buried at the site over 120 years ago. On Onstott Lake, now extinct, in 1861 and 1862, it was a bustling camp, known as Camp Benjamin, with over 1200 enlisted men and officers stationed there. The site is on private property, with entrance possible only through a locked gate near Bois d' Arc creek north of the now non-existent Hilger school and is about five miles west of north of Dodd City. Onstott Lake was a shallow water body and was not a man made lake. Being a low spot near Bois d' Arc it was caused and kept in existence by periodic overflows during heavy rainy seasons by Bois d' Arc. With the, channeling of part of the creek which traverses Fannin county from the southwest, (east of Whitewright) to Red River near Riverby in northeast Fannin county, there are less overflows than was the case a century ago and the lake no longer exists. The outline of the lake can be determined however, historian Dan Hembree said Thursday, even though much of the bed of the old like is now covered with large timber. A plate attached to the cross and which will serve until replaced with a permanent marker in commemoration of these Confederate dead, reads "Cemetery of the 9th Regiment Texas Volunteer Infantry Confederate Army 1861 - 1862." 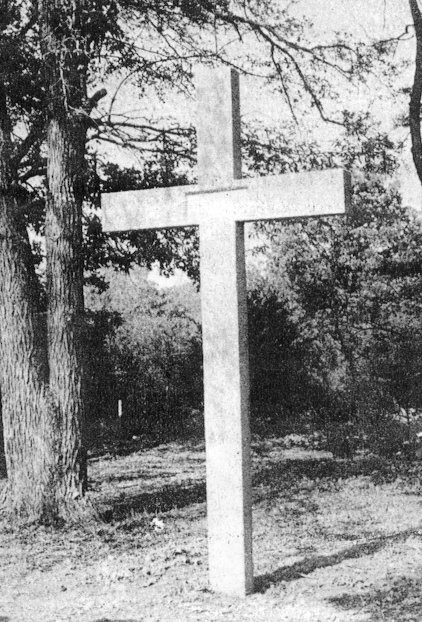 The cross and temporary marker was prepared and erected by Dan Hembree. Date for a brief inspection of the site by historical commission members of Fannin and Lamar counties and members of the press, has been tentatively set for Sunday afternoon, May 4. Since the burial site is some distance off an all-weather road, should rain occur a day or so prior to or on May 4th, the roads would be impassable and a new date for the inspection set, Hembree said. Hembree of Route 2, Honey Grove has spent a great amount of time during the past seven years researching archives concerning Camp Benjamin and this burial ground. It is known from records that some 50 to 60 members of the regiment were ill with measles and/or pneumonia when they arrived at Camp Benjamin. A number are shown on the muster rolls as dead but no date or place of death is given. Seven members of the regiment however, died during the time it was encamped at Camp Benjamin on Onstott Lake. Information prepared from date assembled by Dan Hembree concerning records of the 9th Regiment, Texas Volunteer Infantry, Confederate Army, Army of Tennessee, may be found on Page 4 of this week's, paper. Others who may have died and are buried there are shown as left sick at Camp Benjamin on January 1, 182. Nothing now marks the graves of the soldiers at Camp Benjamin, except the knowledge handed down through the generation's of the families who have lived in the area from that time. Of these Mr. Hubert Pearson of Dodd City maintained the graves in his life time, as Mr. Pearson was a youth on the land where the graves are found as his father owned the land; the site also known to other members of that family. Mr. Doyle Chapman of Dodd City also has lived near the site, and the knowledge of the soldiers graves was passed to him as a young man. The land is now owned by Reverend Daniel B. Ray of Irving, Texas. Samuel B. Maxey was appointed a Brig. Gen. after the regiment went East of the Mississippi. Wright A. Stanley of Bonham was elected Col. to replace Maxey, and it was under Stanley's direct command that eight companies of the regiment were engaged in the battle at Shiloh, Tennessee on the 6th, & 7th. of April, 1862. By the time the eight companies of the regiment reached the Shiloh battle they had been so reduced in numbers because of death from disease, and those unfit for duty because of sickness, that the eight companies had a combined strength of only 226 including the officers and enlisted men. Of these killed in action were 3 commissioned officers, 11 enlisted. Wounded 2 commissioned, 40 enlisted. 11 missing in action. "The presidents of the Fannin County and the Lamar County Historical Commissions led contingents of their members and representatives of the press on an inspection tour of a Civil War burial site north of Dodd City on Sunday afternoon, May 4. Dr. William F. King of Bonham is president of the Fannin County unit and Dwight Chaney is his Lamar county counter part. Around 40 persons toured the site with the Commissions which is on private property some distance from a county road. The burial site is just south of a now non-existent lake near Bois d' Arc Creek north of northwest of Dodd City and about due north of a former flourishing Fannin County community, Hilger. The Camp was named Camp Benjamin and the adjacent lake was Lake Onstott. The lake was created by water trapped in a low lake bed from Bois d'Arc overflow. It has long since dried up but the outline and general contour of the lake is visible today..
Dan Hembree of Route 2, Honey Grove who has spent many hours of work researching archives and available material on Camp Benjamin and the regiment which trained there for a short period said that the regiment went into camp at Camp Rusk in Lamar County (now in Delta County) on October 30th, 1861 and was mustered into the Provisional Confederate Army on November 16, 1861.. The 9th Regiment Texas Volunteer Infantry was composed of ten companies, which if at full strength would approximate around 1150 to 1200 men. Hembree says that a Confederate Infantry Company at full strength was made up of 100 privates and 15 commissioned or appointed officers.. The regiment left Camp Rusk because of "impurity... [part of column missing] ... jamin arriving there December 13, 1861, Hembree said records reveal.. The original captains who raised companies who composed the 9th Regiment were: Co. A, E. J. Shelton, Lamar County; Co. B, Smith Ragsdale, Clarksville; Co. C, William H. Young, Grayson County; Co. D, William E. Beeson, Hopkins County Co. E. James Hill, Persimmon Grove, Lamar County; Co. F, James A. Leftwich Mount Pleasant; Co. G, Joseph A. Moore, Tarrant [sic, should be Hopkins] County; Co. H, Wright, A. Stanley, Bonham; Co. I, J. J. Dickson, McKinney and Co. K, Miles A. Dillard, Toilets Prairie, Lamar County. . According to history assembled by Hembree from various records and reliable sources, there are at least seven Confederate soldiers, buried at the site. History shows that "disease was a greater killer than Yankee bullets," Hembree said. There was an epidemic of measles and pneumonia in the camp almost from the first day and one man died at Camp, Rusk and, another on the march to Camp Benjamin and seven men died within the short period of time the regiment was encamped at Camp Benjamin..
"I am told there are possibly eight or ten graves at Camp Benjamin. There is a possibility that the man who died on the march from Camp Rusk to Camp Benjamin may be buried in the cemetery at Camp Benjamin," Hembree said..
A number of men on the muster roll of the Regiment are shown as dead, but no place or date of death is listed for most of them. It is believed the following were buried at Camp Benjamin because of the dates of their death. They are C. C. Coleman, December 27; C. J. Dwyer, December 23, Silvester Howe, December 20, J. Willett. December 26, J. W. Harmon, December 28, J. N. Westbrook, December, 31. All those dates were 1861 and W. R. Todd, January 1, 1862.. The Regiment left Camp Benjamin on January 1, 1862 and marched to Little Rock, Arkansas and then on to luka, Mississippi, where they died at about two a day so that by the time the remaining eight companies was only 226 men including officers and enlisted, Hembree said. The remaining eight companies would have been a strength of over 800 hundred without the effect of sickness and death. The two companies from the regiment not in the battle of Shiloh were deployed as guards for the railroad into the Shiloh area..
Samuel Bell Maxey organized this regiment and swore it into service. He did not remain with the regiment long, however as he was appointed a Brigadier General on March 4, 1862 and left the regiment. Wright A. Stanley, the original captain of Company H was elected colonel, replacing Maxey. It was under Stanley's direct command that eight companies of the regiment took part in the battle of Shiloh, Tennessee, April 6 and 7, 1862. Gen. Maxey did not command this regiment in a single battle in which it ever engaged, records point out, Hembree said. .
William Young, original captain of C Company was, elected Colonel of the Regiment to replace Stanley. Young was in time appointed a Brigedier General: and, it was under William H. Young as colonel and later a brigadier general that the 9th Texas fought through the war with the Army of Tennessee..
A Texas State Historical Marker is proposed for the gravesite. When Hembree gets all required material documented the two county commissions will forward information to the state and the state marker will be authorized and erected.. This group from Paris, members of the Sam B. Maxey Camp, Sons of the Confederacy, are shown at the Camp Benjamin Cemetery north of Dodd City, when the Fannin County and Lamar County Historical Commission members made a site inspection of the cemetery, Sunday Mat 4th . It is believed that at least 7 and possibly 10 members of the 9th Regiment, Texas Volunteer Infantry are buried there. - Staff Photo. The marker will list in part, "Camp Benjamin. Here in the South bank of Onstott Lake, Fannin County, Texas, December 13, 1861, the 9th Regiment Texas Volunteer Infantry of the Provisional Army of the Confederate States of America went into training camp. The plague stands in the Cemetery of that Regiment. First Colonel of the Regiment was S. B. Maxey." The marker then lists the ten original captains and the place or area where each raised their company.. The final legend on the Proposed marker will say, "In the early hours of January 1, 1862, with a roll of the drums the camp fires began fading into darkness as this regiment formed in the line of march on that long road that would lead to and beyond the guns at Shiloh, Tennessee.". In addition to paper work involved, Hembree has expended a considerable amount of physical labor related to the gravesite. He has cleared and mowed the cemetery proper and has made and erected a large concrete reinforced temporary marker at the site. Individual grave stakes have also been placed in the cemetery by Hembree to coincide with the approximate location of the graves in keeping with information received from people formerly living in the area of the local camp." Back row, left to right, Dan Hembree, Rt. 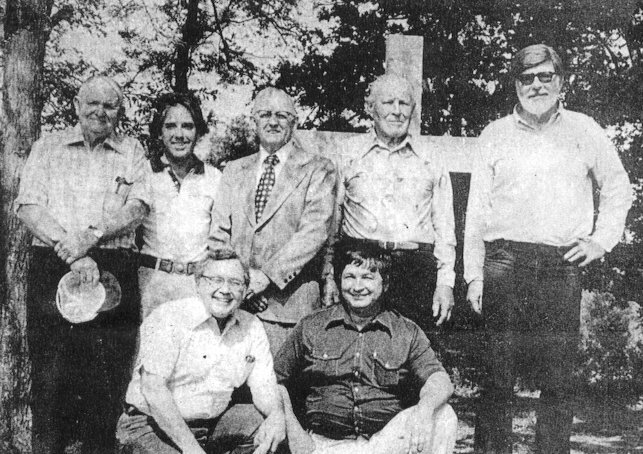 2, Honey Grove; Dwight Chaney of Paris, president of the Lamar County Historical Commission; Eugene Pearson of Savoy; Dave Ray of Ector; the Rev. Dan Ray of Irving, missionary to Korea. 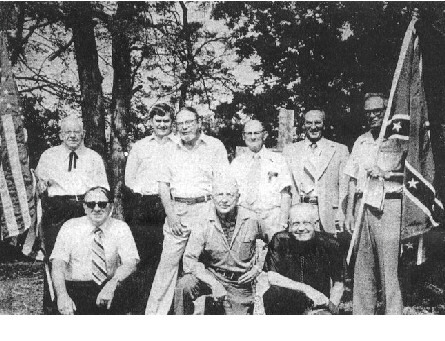 Front row, Dr. William F. King, Bonham, president, Fannin County Historical Commission and Doyle Chapman of Dodd City. Hembree, researched archives and other pertinent material concerning the location of the cemetery at Camp Benjamin, Confederate Infantry Camp, north of Dodd City. He also cleared the site, marked the graves and erected a re-inforced concrete cross as a temporary marking until an official State Historical marker is erected. Pearson of Savoy, is a former resident of the immediate area of the cemetery and remembers as a child when the graves were "mounded up." The Rev. Dan Ray is the present owner of the property where the cemetery is situated. He is a Baptist missionary in Korea and the son of a longtime missionary, the late Rev. Rex Ray. Chapman is a native of the area as is Pearson and he assisted Hembree in situating the exact grave spots. The picture of this group was made when some forty members of the Fannin and Lamar County Historical Commission attended a brief site inspection ceremony there Sunday afternoon, May 4th. The cemetery and Camp are just south of a former natural lake, Lake Onstott, about five miles west of north of Dodd City. - Staff Photo.